PORTLAND -- The NBA has provided the sporting world with ample entertainment in the days leading up to the trade deadline. From the seemingly endless rumors about trades that ultimately didn’t happen to the flurry of deals executed right before the deadline, there’s been no lack of interesting storylines in the first week of February. But with the trade market now closed, the attention of the league turns back to the actual games, which can be pretty darn exciting, too. In the first game for both teams after the deadline, the Portland Trail Blazers led by as many as 21 points in the third quarter before gutting out a 127-118 victory versus the San Antonio Spurs in front of a sellout crowd of 19,393 Thursday night at the Moda Center. The Trail Blazers are now 33-21 overall and 23-8 at home this season. Portland improves to 2-1 versus San Antonio this season and finish a four-game homestand with a 3-1 record. After trailing by as many as six points in the first quarter, the Trail Blazers outscored the the Spurs by 16 in the second quarter behind the play of CJ McCollum, Jusuf Nurkić and Jake Layman to take a 70-57 lead into the halftime intermission. That lead would expand to 21 in the third quarter thanks to a 27-8 run. But DeMar DeRozan and Rudy Gay got the Spurs back into the game almost entirely between the two of them, combining for 33 of San Antonio’s 36 points in the third quarter. The result was San Antonio tying the game at 88-88 with two minutes to play in the third quarter after a DeRozan nine-foot jumper found the mark. 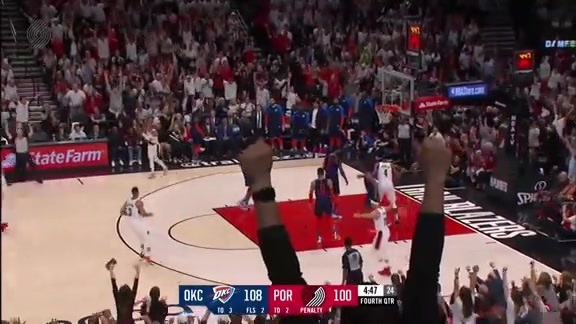 But Damian Lillard answered DeRozan and Gay’s heroics with his own, scoring Portland’s final eight points of the third to give the home team a 96-90 lead going into the fourth quarter. “We started off the game going back and forth, both teams scoring and then kind of got on top of that, had a good second quarter, had control of the game, started the third well too and they had a run," said Lillard. "A lot of mistakes – losing guys, letting them get open shots – they just, they had a really good stretch. That happens. It’s a game of runs. They had their run, but I was proud of how we handled that." A 10-2 run early in the fourth gave the Trail Blazers some additional breathing room, and with the Spurs playing the second game of a back-to-back after losing to the Warriors in Oakland Tuesday night, Portland was able to wear down the road team to secure the nine-point victory. “We never panicked," said McCollum, who scored 14 of his 30 points in the fourth quarter. "We know they’re a good team, well coached, and they’re going to execute and play hard. Just wanted to get some stops and kind of stop the bleeding. 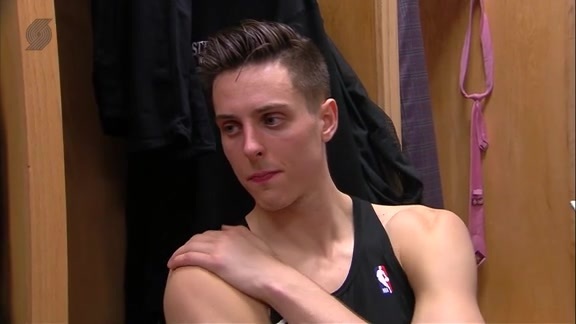 Rudy Gay was great in that third quarter, DeMar, L.A., they all contributed and made it difficult for us but we did enough to come away with a win." Thursday night’s contest as the first as a Trail Blazer for Rodney Hood, who the Trail Blazers acquired from the Cleveland Cavaliers for Nik Stauskas, Wade Baldwin IV and two future second round draft picks. "I felt great being out there for the first time," said Hood. "The fans did a great job of working with me, cheering me on. Once the first bucket went down, I felt at home, so it was good." The 6-8 guard/forward in his fifth season out of Duke missed his first shot, a 26-foot stepback jumper, but that would be his only miss of the night, as he finished the game 6-of-7 from the field and 2-of-3 from three for 14 points on 6-of-7 shooting from the field and 2-of-3 shooting from three to go with three rebounds in 25 minutes. "He had a good rhythm," said Stotts. "I think he took the shots that were there. He just played the game. It wasn’t like he was trying to force it, he wasn’t trying to shy away from anything, I thought he just played the game. Defensively, he picked up our switching and took the individual challenge when he was there. Just a good, solid game at both ends." CJ McCollum scored a team-high 30 points on 10-of-21 shooting (7-13 3-PT, 3-3 FT) to go with nine rebounds and two assists. It was his third straight game scoring 30-plus points, marking the first time in his career that McCollum has achieved the feat. His seven three-pointers matched his career high (four times). Damian Lillard recorded 24 points (10-20 FG, 0-7 3-PT, 4-4 FT), two rebounds, nine assists and matched his season high with five steals. It was his 40th game this season with 20-plus points. Jusuf Nurkic finished with 22 points (9-15 FG, 4-4 FT), three rebounds, six assists, one steal and two blocks. It was the 16th time this season that Nurkic scored 20-plus points, matching his most 20-point games in a season in his career (16, 2017-18). Jake Layman tallied 13 points (5-10 FG, 1-5 3-PT, 2-2 FT), three rebounds and two assists. It was his third straight outing in double figures and the ninth time in the last 11 contests that he scored in double figures. Al-Farouq Aminu logged 11 points (3-5 FG, 5-5 FT), eight rebounds, one assist and one steal. DeMar DeRozan scored a game-high 35 points (14-28 FG, 7-8 FT) to go with six rebounds and six assists for the Spurs. Rudy Gay logged 25 points (10-15 FG, 5-6 3-PT), three rebounds, two assists and one block. He scored 16 of his points in the third quarter (6-6 FG, 4-4 3-PT). • The Trail Blazers outscored the Spurs in the paint, 62-48, and on the fast break, 18-2. • The Trail Blazers matched their season high with 11 steals to go with four blocks while the Spurs recorded three steals and three blocks. • The Trail Blazers reserves outscored the San Antonio bench, 38-28. • Portland recorded 26 assists on 49 made field goals while the Spurs had 19 assists on 48 field goals. • Portland turned the ball over eight times while forcing San Antonio into 18 turnovers. 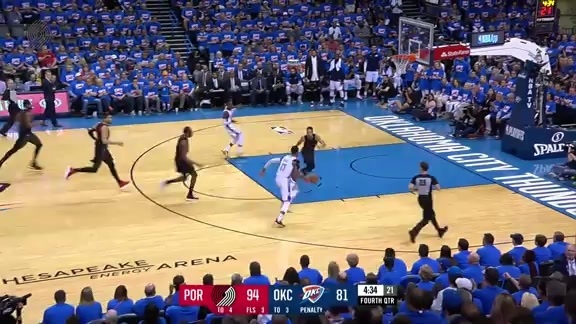 • The Trail Blazers shot 100% from the free throw line, connecting on all 18 attempts. San Antonio was 10-of-14 from the stripe (71.4%). With a four-game, 15-day homestand now complete, the Trail Blazers hit the road for a road back-to-back starting with a matinee in Dallas versus the Mavericks on Sunday afternoon. Tipoff is scheduled for 12 p.m.